When I began working as a food photographer nearly thirteen years ago I was shocked at the huge quantity of food thrown out after being photographed. Entire turkeys and cakes would be swept off the set by the food crew and dumped into the trash. When I enquired as to why, I would be informed that the food had “no further use” despite its being perfectly edible. As time went on I became increasingly disheartened with this blatant waste so in 2005 I began to look for someone who would be interested in taking the food and found OzHarvest. Regular food pick ups began to take place from my studio and I was happy to see that food was going to those who needed it instead of going to landfill. OzHarvest are without a doubt one of my favourite charities. The Sydney-based organisation was created in 2004 by the visionary Ronni Kahn who decided to set up a service which would specifically deal with the leftover food generated by the hospitality and events industries. Having worked in these industries for many years Ronni was frustrated by the immense amounts of food being thrown out. Armed with the intention of directing it out of landfill and to those in need, Ozharvest was born. Their tireless efforts at creating awareness around food waste through social media and special events such as Feeding The 5000 are nothing short of amazing and admirable. Ronni and her team are relentless in their work, spreading the word and good deeds to the Australian public and beyond. Recently a stunning cookbook was released by Ronni and her team at OzHarvest with over 120 recipes with ideas for using leftovers and gluts of produce with contributions by some of Australia’s best known chefs and food writers. Photographed by Alan Benson and styled by one of my favourite food stylists David Morgan, the book is a beautifully designed collection of recipes that will be the pride of your cookbook collection. All proceeds from the book go to OzHarvest and every purchase will allow them to deliver more than 60 meals to people in need. For further information about OzHarvest, or to purchase the book please click here. And so we come to this week’s recipe which I too hope will inspire readers to use up leftovers, in particular rice. It came as a shock to me recently to find out that over 1400 litres of water are needed to grow just one kilo of rice. As it is so cheap and plentiful, it is also a food that is regularly thrown out. This recipe came about after the need to use up a pilaf which was in danger of meeting the same fate. I decided to incorporate it into a shakshouka, a baked egg dish most commonly found on Israeli and Moroccan menus. Shakshouka means “a mixture” in Arabic slang, a fitting name for a dish which is indeed a mixture of different ingredients thrown together to create a complete meal. In Morocco the dish is eaten mainly for breakfast, in Israel it is eaten most commonly for dinner. I can assure you that when it all comes together with rice it truly is a magnificent dish you can eat at any time of the day. I know for me, using up leftovers and rescuing food gives me that warm fuzzy feeling that I’ve been resourceful and thrifty, and that I can share my good fortune to be able to eat three times a day when so many others can’t. After all, waste not want not, and think about how you too can keep your food wastage down and contribute to someone who might be hungry. That leftover food could mean all the difference to them. OzHarvest’s website is www.ozharvest.org for more information and how you can help. Serves 2-4. Preparation time: 20 minutes, cooking time 45 minutes. Preheat oven to 200˚C (approx 400˚F). 1. Heat oil in a heavy based saucepan over medium and fry the onion and garlic until it has softened and slightly browned. (I don’t like crunchy onion in this dish so I slightly caramelise the onion to make sure it is soft and sweet). Add the capsicum and cook for a few minutes before adding the tin of tomatoes. Add the ground coriander, sweet paprika and chilli flakes and cook for ten minutes before adding the maple syrup (or sugar). Add the seasonings, stir and taste. If you prefer a slightly sweeter taste add a little more sweetener. Simmer for a further ten minutes to allow flavours to develop. 2. In the bottom of a shallow baking dish place the leftover rice and top with the sauce. Make four wells with a spoon and crack the eggs into each hole. 3. Place the dish into the hot oven for approximately 20 minutes or until the eggs have cooked to your liking. The timing will vary depending on how you like your eggs cooked and the type of oven you have. I like the yolks soft but not overly runny. I find cooking time varies between 20-30 minutes. 4. Once shakshouka is cooked, sprinkle over the parsley and serve. Amazing with acuka (pictured in the centre of the shakshouka), the Turkish walnut and paprika spread I blogged about a few weeks ago. * Incidentally this dish is amazing with or without the rice. For a Paleo version omit the rice altogether and use maple syrup or honey to slightly sweeten. In the way that Ozharvest like to rescue food, I like to rescue things out of the trash, particularly hard rubbish council clean ups. I happen to live in a part of Sydney in which the local government has sadly very little in the way of environmental initiatives and they make it simply too easy for residents to throw away perfectly useable household goods. 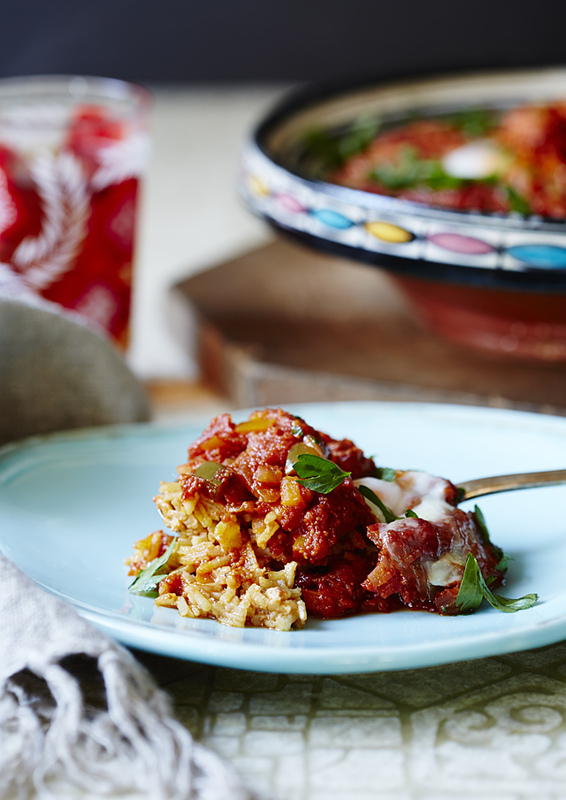 In this image I use a hand painted Moroccan tagine found in one such rubbish collection as the baking dish for the shakshouka. The tea glass and background (which is a piece of old ripped up linoleum) are also out of the trash. The wooden board, spoon and blue plate are from local op shops and the fringed tea towel was purchased on Etsy. The only light used in these images is window light and I used a Canon 5D Mark 3. I hate all of the food waste that goes along with our profession as well. it’s refreshing to hear someone else speak up about it. 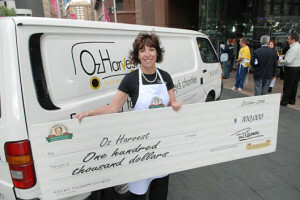 OzHarvest sounds like a great charity! And this shakshouka is making me so hungry. I just discovered your blog and boy am I glad! I eat mostly paleo, for the exception of not being lactose free, I could never give up on cheese. I love experimenting in the kitchen but can get down with the classics (all the famous Russian dishes) as well. 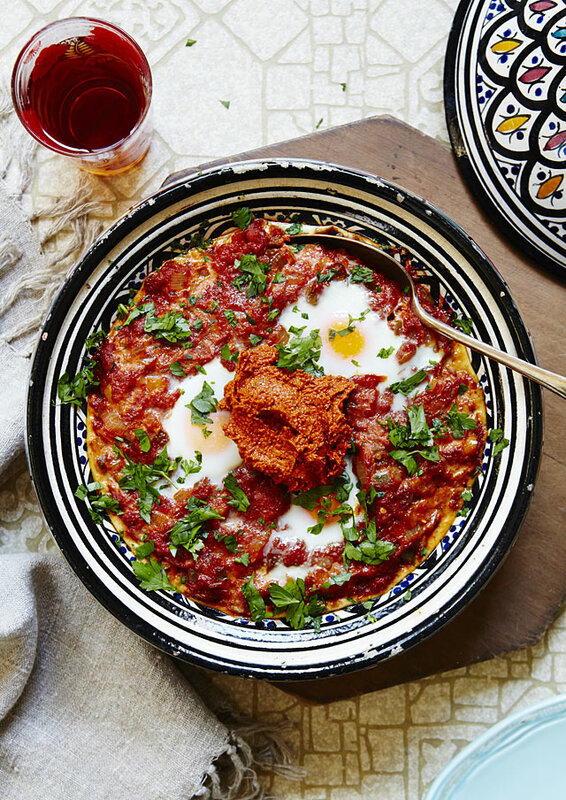 Shakshuka is one of my favorite all-time breakfast any-time dishes.